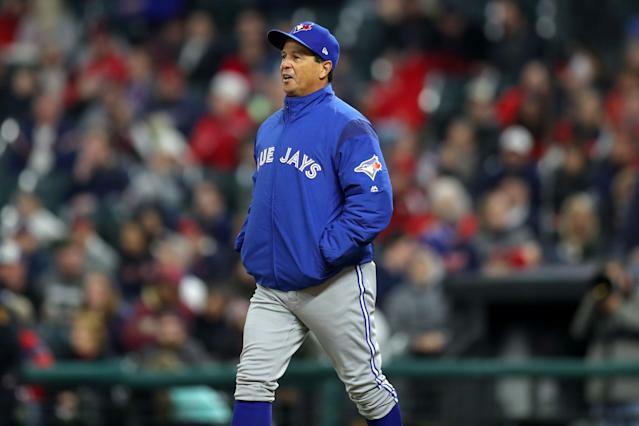 The Toronto Blue Jays came into the 2019 season flying the banner of youth and growth, knowingly trading experience for future upside in several places on the roster. With focus on youth and growth comes mistakes, both physical and mental, as players find their way in the world of major league baseball. All that pretence is to say: the mental mistake on Monday night by two Blue Jays base runners was so completely out of the ordinary that it was staggering. With Teoscar Hernandez on first in the sixth inning of Monday’s game against the Minnesota Twins, Brandon Drury stood at the plate against Martín Pérez. With the count at 2-2, Drury took a fastball low for ball-three. After the pitch, Drury calmly tossed his bat back towards the dugout and undid his elbow guard, assuming he’d just been walked. This is a moderately common thing that you might see once a month if you watch baseball games every day. It happens. What DOESN’T usually happen, is that the runner on first also starts calmly walking to the next base. Unfortunately for the Blue Jays, Hernandez bought Drury’s act that it was ball-four, and was left an absolute sitting duck on the base-paths. The Twins execute the extremely basic “Casual throw to first” to technically record a ‘caught stealing’ on Hernandez, while both he and Drury are left just sort of shrugging on the field. The answer? A lot of pacing and swearing. For those curious about how Drury’s at-bat ended after that calamity on 3-2? A no-doubt walk, of course. And that growth we talked about earlier? It came back in a big way as well. The Blue Jays eventually won the game 5-3, thanks to a three-run home run in the 8th inning by who else but Teoscar Hernandez. The 2019 Toronto Blue Jays: They’ll do that to you!